When you come to Garrett County this summer, why stay in any old hotel? A Deep Creek bed and breakfast like Lake Pointe Inn is the ideal destination for a getaway. You get the best luxury amenities and furnishings combined with the cozy atmosphere of a smaller inn. The benefits of staying at a Deep Creek Lake bed and breakfast are numerous, but we’ve narrowed it down to ten. During your time at our Deep Creek Lake bed and breakfast, our staff will give you individualized attention and share tips and recommendations on what to do and see during your getaway. The Lake Pointe Inn innkeeper and staff are experts on the area and will share the best aspects of the region with you. We love it here, and we want you to love it too! When you stay with us, you won’t be far from the water at all. Lake Pointe Inn is right on the lake, so you can take a leisurely stroll down to the docks or simply take in the view from a rocker on our porch. Plus, many of our rooms have great lake views from private balconies furnished with adirondack chairs. There is no better way to explore Deep Creek Lake than to take a paddle around the waters in one of the inn’s canoes or kayaks. Guests are also welcome to use our bicycles to explore the surroundings by land. Each evening, our pontoon boat, Tight Squeeze, takes a cruise around the lake. Relax and chat with your fellow guests while taking in the beauty of the lake. 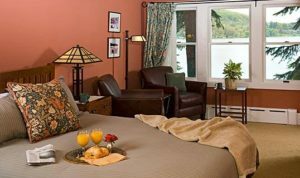 Our Deep Creek Lake bed and breakfast is decorated in the Arts and Crafts tradition, which complements the scenic beauty of the lake. Our guest rooms and common areas feature this timeless style, which creates a comfortable yet elegant atmosphere. 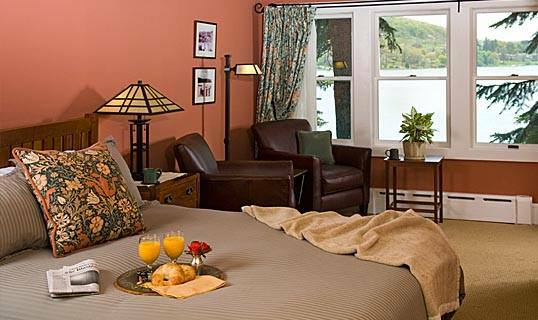 Expect mission-style furniture, natural motifs, and textiles from the legendary William Morris & Co.
You won’t find cookie cutter rooms at our Deep Creek Lake bed and breakfast! Each guest room and suite is individually and thoughtfully decorated so each has unique character. All of our rooms feature luxury amenities and and furnishing, so you can rest in complete comfort. Lake Pointe Inn is ideally located near all the best local attractions and activities. We’re right on the lake, so its not a trek to the water. And Wisp Resort is just across the street from us and has great activities all year long. Deep Creek Lake State Park is just down the road and has plenty of hiking trails and swimming beaches. Make an appointment with one of our massage therapists. Reflexology, Swedish massage and hot stone therapy treatments are available exclusively to guests in our dedicated massage room. You won’t find any hotel vending machines here, but you will find the dining room stocked with complimentary beverages, baked goods, popcorn and fruits all day. Each floor also has a beverage bar full of complimentary drinks such as wine, beer, soft drinks, and coffee. When it comest to the benefits of staying at a Deep Creek Lake bed and breakfast is, well…breakfast! Each morning you can indulge in a full breakfast complete with fruits, baked goods, granolas and a homemade hot entree. Or if you want to hit the lake or the surrounding trails early, take advantage of a continental breakfast. Now that you know the advantages of staying with us at our Deep Creek Lake bed and breakfast, be sure to book your room today! Summer is a busy time around Lake Pointe Inn, so don’t miss out on an unparalleled Deep Creek Lake experience. We’ll see you soon!